​Anacortes was growing in the 1970s as the beauty of Fidalgo Island and the congeniality of its communities lured families to new homes, all within steps of the sea. It was not long before an idea began to spread among newcomers and old-timers: there was a need for a yacht club that would bring sailors and power boaters together for cruising adventures, social and educational activities ashore and the sharing of nautical skills and adventures. Richard Sands, a businessman in the growing Skyline community on the west shore of Fidalgo, liked the concept of a new club that would emphasize cruising and seamanship and tested the idea with Alice Perry, owner-operator of a boat charter firm. She applauded the proposal and together they began building the foundation for the Fidalgo Yacht Club. Others, including Marvin Mackey, an Anacortes banker who would become the first commodore of the club, and Don McKee, an architect who would serve as the second commodore, soon joined the planning effort and together they would form the nucleus of FYC. FYC became a legal and living entity on December 10, 1976, with the filing of articles of incorporation in Olympia. In the first months, club members gathered in homes for meetings and social activities. Vigorous recruitment began and at the end of the first year the club counted 32 couples as members and a fleet of 25 boats. With continuing growth, the club began meeting in the Skyline Beach Club and in 1995 created a clubhouse on Sands Way that continues to be home for FYC. A strong tradition began in 1982 when FYC invited the Capital City Yacht Club of Sidney, B.C., to Anacortes for a weekend gathering. It was a hit. An FYC fleet cruised to Sidney the following year and the border-crossing exchanges have been on the clubs’ cruising calendars since. Working from a strong base of dedicated volunteers, Fidalgo Yacht Club has lived up to the goals of its founders. The club schedules educational and training events and sponsors group cruises in spring and fall. Members head for popular destinations in British Columbia and Alaska during the summer, with experienced cruisers willingly sharing knowledge and destinations with newcomers. Richard Sands, Fidalgo Yacht Club's founder. Capidalgo with FYC since 1982. 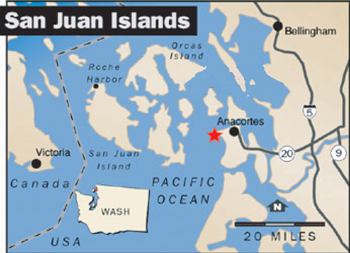 Fidalgo Yacht Club is in Anacortes, on Fidalgo Island's northwest shore, a jumping off point to the San Juan Islands and beyond.